Sarah started Under the Chuppah in 2005 after having a wonderful experience planning her own wedding. She saw a need for a wedding coordinator who could create truly beautiful, unique and distinctive events for the Jewish community. Sarah�s reputation has quickly grown as a planner who produces elegant, upscale and innovative weddings while consistently going the extra mile to ensure her clients� dreams become reality. Prior to starting Under The Chuppah, Sarah worked for over a decade as a producer of television, theatre and film. Her experience in this demanding and fast-paced world helped her to develop excellent production, organizational and management skills. These qualities have helped her stand out as a wedding coordinator. Sarah can tackle any challenge calmly and professionally, allowing the bride and groom to remain stress-free and confident throughout the planning process. She pledges to ensure that every wedding she helps create is as memorable and individual as the clients themselves. Get more for your wedding! 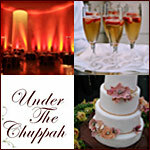 Don't forget to mention ChossonKallah.com when visiting Under the Chuppah.